Because we see ourselves from the front in mirrors, we often neglect the care of certain body parts. Today I'll talk about the ears, and behind the ears. I can't tell you how many well put-together women (and guys) with icky ears I've seen. Most of the time we can't see what our ear area looks like, but others do. For example when someone stands behind you when you are showing them something on a computer. Depending on your wax situation, you might need to clean your ears anywhere from twice a week to once a fortnight. I like to clean my ears every time I wash my hair, since I really really hate wet ears. You have probably heard that Q-tips aren't very good for your ears. This is because most people clean too deep, and end up pushing the wax back into the ears. This can cause really painful infections! Aggressive cleaning inside the ear canal can also increase the production of wax, and scratch the ear canal or ear drum. The solution? Buy the thick Q-tips meant for kids which will let you clean the outside of the ear tunnel but not the inside. Or pour a bit of warm water onto a muslin cloth, add a bit of cleanser or soap (if you want to), wrap it around the small finger and clean the outside of the ear canal. A nice way to get a deep-clean is to put a few drops of oil into one ear and lie down with this ear up for 1-15 minutes. You can use a plant-based oil or mineral oil. Then, tave a warm shower. The warmth of the shower and the oil will help the wax to dissolve and flow out of the ear. Next day, do the other ear. If you have a lot of ear wax coming out, don't worry about it too much. Better out than in. Do clean the outside of the ear canal regularly, and you're set. If you have really dry ear wax (usually east Asians), you might want to wet your Q-tip, or wax-dissolving ear-drops, or try one of those ear-picks (again, only on the outside!). Don't forget the folds of the outside ear. Use a Q-tip, cotton swab or a corner of a washcloth or microfibre cloth or towel. Wet it, and if your ears tend to be greasy you can use a dash of face cleanser. I like to use my micellar cleanser for this. Don't forget to clean behind the ear! The area is not as hidden as you think, especially if you have short hair or wear your hair up. If you have piercings, it is really important to remove them regularly and really clean the hole. Dead skin and grease builds up there. Use moist cotton-wool or a washcloth for the skin (you can add a dash of soap or cleanser). Give your piercings a clean as well: soak them in alcohol or hydrogen peroxide, and brush of the gunk with an old toothbrush. If you tend to have a sticky-wound situation in the folds of your outer ear or behind the ear, you need to be extra careful. This usually means that the folds are "closed" (unlike those of the girl in the photo on top), and things have to be kept clean and dry. The best time to clean is after taking a shower, when the skin is soaked. Dip a cotton wool or Q-tip in oil, and very gently remove the scabby skin. A drop of an antiseptic oil (tea-tree, manuka or tamanu) mixed with a regular oil can help the skin to heal faster, or Homeoplasmine or any other balm meant for wounds or irritated skin. Always dry those areas after showers. 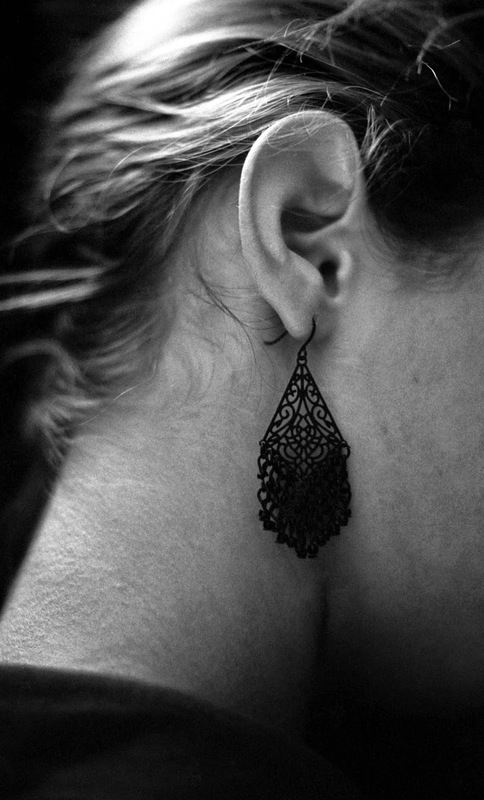 And a last small tip: if you are sensitive to earrings made of non-noble metals, you don't have to be limited to pricier earrings. Here is what I do: buy earring hooks and small pliers from a hobby store and swap the allergy causing hooks on your old earrings. Depending on how sensitive your skin is you can decide between simply zinc-free, or silver coated, or silver. Switching the hooks takes just a minute! How do you clean your ears? Do share your tips! I was thinking to do a couple of posts to cover other neglected body parts: elbows, bikini line, back. Is there any other body part you'd like me to cover?